Recently many LGBT travelers have discovered the great vacation bargain which Buenos Aires offers in today's difficult economic climate. Many airlines and accommodations have been promoting special tariffs for this holiday season as Spring begins in South America. And Buenos Aires is already recognized as one of the hot new gay vacation meccas where the cost of living is much lower than North American and European prices. It truly is the best place at the moment for lower cost vacations without sacrificing any of those great holiday memories. Therefore it was very fitting that last Thursday evening, the 15th. October, IGLTA hosted an industry networking gathering at Sky Bar in the Buenos Aires Axel Hotel. The event was open to all IGLTA Members, friends in the tourism industry, and LGBT tourism professionals. Just over fifty attendees experienced one-on-one contact with IGLTA staff and members during the event. Mr Tom Nibbio, the IGLTA Manager of Global Partnership Development, was introduced to all attendees by the IGLTA Ambassador to Argentina, Alfredo Ferreyra. Together they gave a short presentation about the organization and its membership benefits. Existing members networked with each other plus potential new members were able to ask questions about IGLTA membership criteria,costs and advantages. Many old friends were re-united and some new relationships were forged for the future. It was a very good opportunity for members of the travel industry to discuss their thoughts or concerns about the upcoming high-season for travel in Latin America. There appeared to be great optimism about the upcoming tourism period despite the worldwide economic downturn. Several members felt that Spring was off to a good early start after a slower than usual winter season. 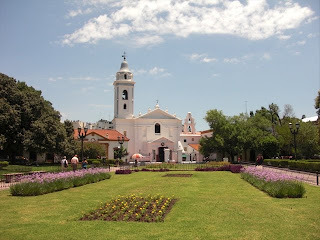 Do your research now and enjoy the great vacation bargains available in Argentina with IGLTA members. These days you might think that there are no options for gay people, but that is completely false. In the last years, a whole gay market has been emerging in Argentina and nowadays you can find gay apartments everywhere you go. If you re looking for a gay neighborhood, I would definitely suggest Palermo. That is what I did last year when I rented a Furnished apartment in Buenos Aires with my partner Kate. We enjoyed it and people treated us properly and nicely. Win a trip to Montreal! Even the sunsets are pink in Cape Town!